Non-tech established companies are starting to get it. If they don’t innovate they die. If they don’t innovate efficiently, they’ll be priced out of the market and eventually die. Customers’ needs are changing at a faster pace and competition is coming in from all sides. If you don’t have innovation processes in place, or an established program (I’m not talking new products only here), you are already feeling it in your overall sales or cost of sales. If you have an innovation program in place, but it’s inefficient or hasn’t been updated in a while, then your program manager is feeling the heat to justify the cost of the program to upper management. Innovation is not something that comes naturally. It requires us to challenge the status quo. Innovation is not only a processes to be followed or skills to be learned. It’s a culture that needs to be experienced to be understood and applied. How does an established company, that lost its innovation culture along the way, go about finding it again? The traditional approach is to hire consultants to help you design and implement an innovation program. Used by itself, the outside consultant approach, takes time. Mostly because it requires a shift, or drastic change, in culture and that is what requires the most time. More often than not, a change in culture requires more time than the market will allow you. Hence you need other ways to accelerate the process without breaking the bank doing so. Given that the culture needs to be experienced, the answer lies in getting both employees and management direct contact with people and/or organisations that have strong innovation cultures. This can happen in two contexts: A) Inside your company or B) Outside your company. Just to be clear, I’m not stating that simply observing or being in contact with innovators will bring (back) an innovation culture to your organisation. It will however accelerate the process when accompanied by a strong internal innovation program implementation. There are several ways of going about inviting innovators inside your company. An easy way is the ‘’lunch and Learn’’ type of approach. It’s used by Google, amongst others. You invite cutting edge experts, on specific topics that are relevant to your company or market, to lunch in your cafeteria or conference room to share their knowledge with your team. Getting an external expert/consultant to host a workshop in your offices is also a great way to expose your team to innovative management techniques and tools. You invite 3-6 experts for a couple of hours early in the morning for a round table discussion in order to solve a problem. The problem can be general such as: What business model would be best for… or specific such as we will need to change piece of equipment A, what should we replace it with? This one requires a lot more preparation but will, if properly done, yield much more results than the previous two. An entire book could be written on this topic but to keep it simple, the host company finds a startup whose product/service is one that it would be a buyer for. 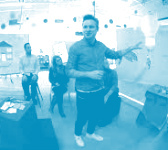 The host offers space (common or open works best), equipment and knowhow to the entrepreneurial team. In exchange the team members share their startup culture with employees and management through observations, one on one interaction and planned meetings. In order for both the host and the startup to get maximum benefits from the experience the host must prepare in advance. The host should assign at least one resource to ensure all goes smoothly and both employees and management actually benefit from this exercise. If you have not attempted this type of integration before I suggest you talk with someone who has experience in managing these hosting programs. This is also a more complex approach that requires a significant amount of planning and management. It entails partnering with another company (in this case one that is more innovative than yours) to join strengths in order to create a innovative solution. An example would be a high tech company partnering with a manufacturer to create a connected product such as a garment that allows the wearer to get their vital signs. Unless you are close to a larger urban center this one may require travelling to one. Most cities have a startup eco-system. This eco-system is full of organisations, entrepreneurs and resources to assist with innovation. They offer flash training, conferences, meetups, workshops and tools usually at very low cost. Most universities have one (or multiple). Incubators can also be NPOs or for profit (usually tied to a VC organisation). They offer low cost (most) programs to help out entrepreneurs. The better ones use the latest innovation management approaches, such as Lean Startup, and a lot of peer to peer learning. Their programs vary widely but most have a, part-time, 3 to 6 month one with very flexible hours. Sending a team to start developing a new product in an outside incubator can really give their entrepreneurial spirit a huge boost. Having the team pass on their learnings and acquired entrepreneurial know-how internally will help the entire organisation. Meetups are local communities of interest. 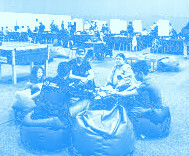 The name comes from the meetup.com platform that was the first (large one) to facilitate the creation, organisation and management of communities. Today, other platforms such as Eventbrite and Facebook also cater to the needs of these communities of interest. Simply search on these platforms for innovation and startup communities in your area. Larger cities are chockfull of them. For example, Montreal, Canada has over 50 of them including Montreal New Tech and the Lean Startup Circle which is present in over 250 cities around the world. Have your employees and managers attend their gatherings, presentations and/or workshops. Not only will they be exposed to the ground root innovation information in your area, they will meet with a large number of entrepreneurs and be exposed to their culture as they network. If there is no innovation or entrepreneurial meetup in your area, create one. It will attract local innovators and entrepreneurs. A side benefit will be the free press your organisation will get for giving back to the community. These have gained in popularity in the last couple of years. Co-working spaces are office spaces that are rented by the hour, the month or yearly. They often have incubators and mentors attached to them. They are mostly used by startups. Hence renting temporary offices for your staff in a co-working space can not only be a solution for a temporary growth spurt but it can also help your staff mingle with entrepreneurs on a daily basis. A word of caution however, unless your staff involve themselves somehow in the startups activities or befriend the entrepreneurs, the entrepreneurial culture will not simply rub off on them. Finally, these events take the shape of hackathons and hackathon-like competitions. If you are not familiar with a hackathon, it’s basically an intense 2.5 day (Friday night to Sunday evening) event where people (all walks of life) or teams show up to solve a specific issue with a tangible solution. The issue is one they bring with them or one suggested by a local company, organisation or government. Hackathons are usually specialised in a sector or type of issue. I refer you to a previous blog post on the Cooperathon, which is one, if not the, largest open innovation competition held in multiple cities (Montreal, Quebec, Lyon). It’s organised by Desjardins credit unions and Hacking Health. Hackathons can be an inside (you host one) and/or outside (participate in) solution to rekindle the innovation culture of your organisation. 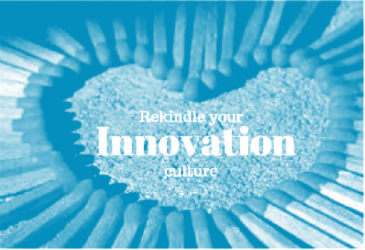 These are but a sample of the different ways your company can rekindle or boost its innovation culture. If you would like to boost or rekindle the innovation culture in your team and are not sure how to go about it, please contact Baker Marketing. It will be our pleasure to help you. Tech companies have been dealing with fast-paced markets for over a decade now. Hence they adjusted already. Not an absolute rule but it makes it easier on the host company.